I’m in a pretty holiday mood, so I would like to do something related to Halloween. The first sketch is a modification of the wooden box Yury showed in class. Instead of the LEDs coming out of the box, there would be laser cut pumpkins in the wood. The LEDs would be incased in a mirror lined box and shine out from the bottom. The second idea is also a modification. 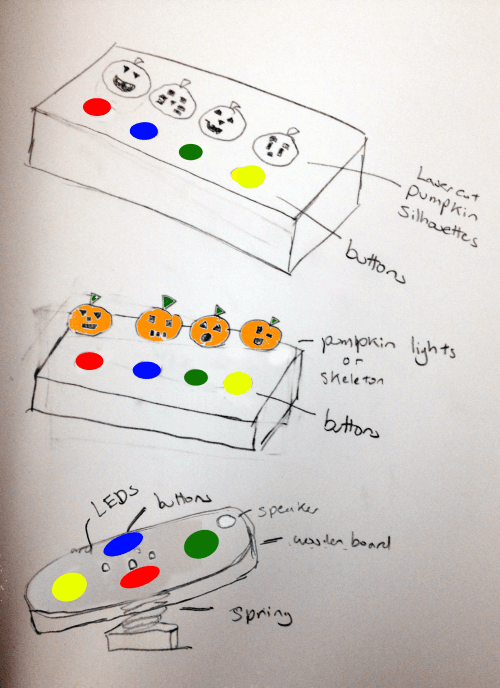 Instead of the round cases, the LEDs would be in plastic pumpkins instead. The third idea is to put the box on a spring, adding an element of unsteadiness to the game.